For some reason I’ve been in a big mood to organize our closets, so I thought we’d discuss — what are your biggest pain points when it comes to closet organization? What solutions have you found that you love? What are your best closet organization hacks? 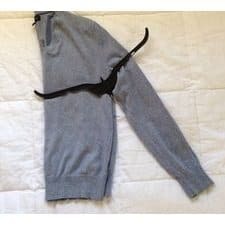 Clear sweater bins galore — Not only do I use these vinyl sweater bins for my seasonal clothing review, but I use them to organize kids’ clothes (particularly all of my eldest son’s clothes that we’ll hand down to my youngest son in a few years). I love that they’re stackable, reusable, and clear — I usually try to stick a few cedar balls inside as well. Velvet hangers — I’ll be honest: I don’t have these everywhere in my closet, but I did buy a few boxes of velvet hangers recently and they’re the first ones I reach for. I have a new system of hanging cardigans on velvet hangers that seems to be working well enough that I’m considering hanging up my pullover sweaters as well. 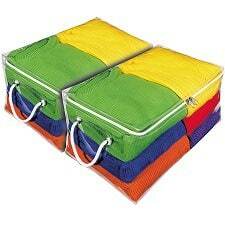 Bags: I have a pretty large bag collection, and when I store them in their dust bags, I totally forget what I have. Plus, I haven’t done a great job at “stuffing” the bags in between wears, so the bags are often stored in a kind of slouchy manner if I can’t lay them flat or if they don’t have enough structure to stand up by themselves. I’ve thought of keeping a picture of my bag collection in my closet, but that seems too insane even for me. 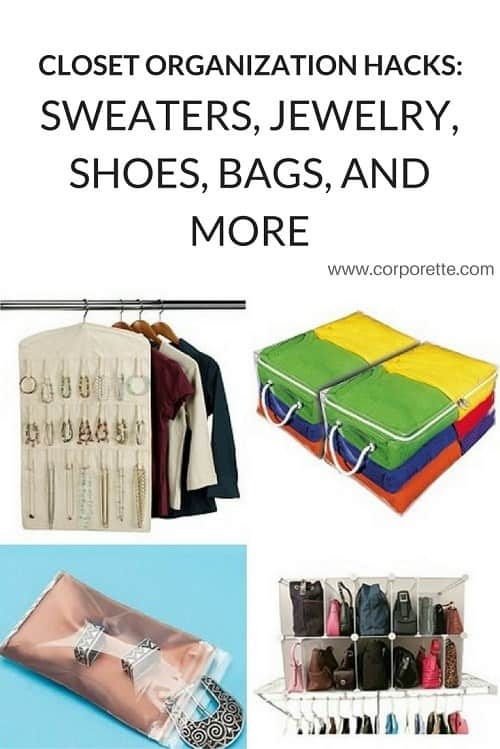 I’ve been considering getting a modular bag organizer (like the one pictured), but I’m not sure that would solve my “I don’t remember what I have” problem. 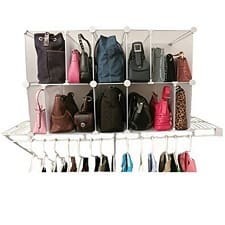 (They also make these kinds of hanging organizers for bags.) I’d love to hear what you guys do to organize and store your bags! All right, ladies, let’s hear it — what are your best closet organization hacks? 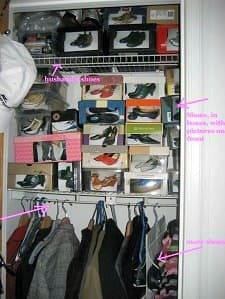 What do you struggle with, and what solutions have you found for organizing your closet(s)? If you’re wearing a long sleeve shirt that covers or reaches your wrist, do you wear your watch underneath or on top the shirt? Underneath. I don’t like the look of the watch on top of the sleeve. Oh man, I can’t stand having my watch over my sleeves. It’s way too bunchy for me and I think it looks weird. 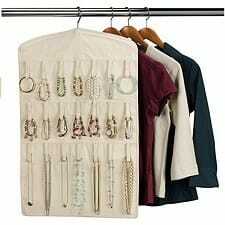 I tried a hanging jewelry organizer for statement necklaces and it did not work for me. I recently mounted a necklace hanger to my closet door and now wear my necklaces much more frequently. I don’t have a ton of necklaces, so I put several of those small, clear Command hooks 0n some “dead” wall space between my clothes and the closet door. By staggering the hooks, I was able to get plenty of room. I love the velvet hangars – that is all I use now. 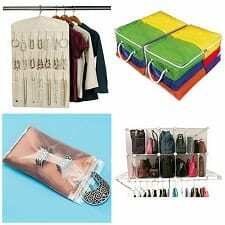 And I use metal shower hooks on the closet rod for hanging my bags – it keeps them up and out of the way, and I can see everything I have. I adopted the recommendation of people here and now store my necklaces hanging on push pins on a cork board. It is perfect because I can see all my options and customize it so it works for both my statement necklaces and the dainty ones. I used to be overwhelmed by finding tissue paper which is “archival quality” to put in/out of my handbags. And no way I could quickly grab and switch out a bag. I found these silver quilted inserts. They are the bomb. This is amazing. Exactly what I need. Thanks for sharing. One hack that worked really well for me when I had a lot of scarves was hanging them on shower hooks, and then placing the shower hooks on a single triangle shaped thick plastic hanger. To keep them from sliding everywhere, I just put a small dot of hot glue (hello sorority crafting days!) on the hanger. My cleaning lady organizes all my closets for me, and label’s everything for me to find on a database in my MacBook Air. She is VERY organized and alway’s helps me find thing’s. I love my cleaneing lady, even if some thing’s go missing from time to time! Overall she is worth it! YAY!!!!! I have a TINY closet and a big wardrobe, so I’m obsessed with my velvet hangers, but they shed black dust all over my closet. Ellen: You have an amazing cleaning lady!